Umpqua Active Shooter - The Lessons! 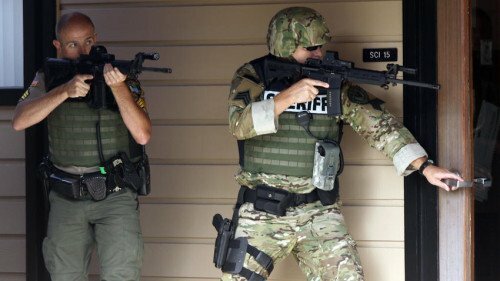 You are here: Home / Active Shooters / Umpqua Active Shooter – The Lessons! 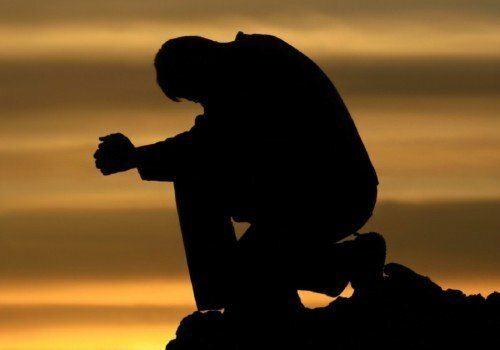 Umpqua Active Shooter – The Lessons! One of the buildings on the Umpqua campus. On October 2, 2015 a deranged gunman entered Umpqua Community College in the southwestern Oregon city of Roseburg, went into at least two classrooms, and began systematically shooting a professor, and students who identified themselves as Christians or failed to identify their religion at all. The murders on the Umpqua Community College campus are another tragedy in America’s struggle to understand mental illness, radicalism, and mass shootings. In the wake of the murders at Umpqua there have been the expected flood of media pundits spouting this theory or that solution with very little supporting evidence that any of their ideas would reduce mass shootings. One thing is certain, the media thrives on our tragedy. It is, after all, big business for them! The more sensational, the more money! Umpqua Community College, like the vast majority of schools, community colleges, and universities in America, is a designated “Gun Free Zone“. And like so many of these places, apparently the murderer didn’t get that message. In fact, the message the murderer received was that his target would be soft with plenty of easy victims. Despite the slick talk of media types and politicians, who play on emotions and promise to have solutions, law enforcement officers cannot allow themselves to be swallowed by the rhetoric of the day. Police officers know, despite their best efforts, it will take several minutes to respond to almost every report of violent crime. From accounts of this incident the first law enforcement officers were on scene within minutes, and actively carried out active shooter protocols. It is reported that those officers engaged the murderer in a gunfight, and ultimately the actions of the officers led the murderer to commit suicide. However, before the officers could successfully intervene, 10 innocents were killed and another 9 were wounded. LESSON #1 – Locations that prohibit lawfully possessed and carried firearms (“Gun Free Zones”) are announcing the collection of easy prey. This is particularly dangerous in locations that house large numbers of civilians, and have vast open areas that are open to the public to enter. These open areas include buildings and hallways that lead to classrooms, offices, cafeterias, or other areas where innocent civilians could gather. The majority of American mass murders have occurred in packed schools, busy theaters, restaurants full of patrons, churches, and so on. There are many examples of an armed citizen ending a deadly threat before police arrive. As law enforcement officers who have sworn an oath to uphold the U.S. Constitution, we must recognize and support a law-abiding citizen’s right to “bear arms”. Each State has a system to qualify a citizen to obtain a Concealed Carry permit (CCW). Police officers should welcome any help in ending a murderous event. We understand that not all CCW permit holders understand the seriousness of their right, but instead of discouraging citizens to protect themselves, we recommend that law enforcement encourage citizens to invest in the proper training to become legally and tactically proficient if the need should arise. In one of the primary classrooms where students were shot, the murderer asked for Christians to stand up and acknowledge their religion. Those who did were quickly shot in the head. Those who refused to declare their religion were shot in the leg. There does not appear to be any organized, or even chaotic response to the shooter murdering people right in front of the next potential homicide victims. However, one of the seriously wounded was Army veteran Chris Mintz. Upon hearing the shots he pulled fire alarms and yelled for those nearby to run. Mintz then went to the classroom the shooter was in, and attempted to block him from exiting to commit more murders. It was during this heroic effort that Mintz was shot 7 times; 3 while blocking the door, and another 4 times when on the ground. After the incident was over Mintz was rushed to surgery and is expected to live. Air Force veteran John Parker was in a building about 200 yards away from the buildings where the shootings took place. He has an Oregon CCW license, and was carrying his concealed handgun the day of the shooting (in violation of school policies). He and a friend were in the veteran center, and others got up at the sound of shots and were getting ready to leave to provide help when Community College Staff blocked them and ordered them back further into the building. I understand the staff’s desire to protect its staff, students, and visitors, so the reaction of these staff members should not be surprising. However, here we had a “good guy with a gun” that may have had a very positive impact in a very short time from when this mass murder began, but was prevented from the short-sighted. In almost every mass shooting in American history, the murderers have selected a “gun free zone” where large amount of innocent citizens will be concentrated. High schools, universities, crowded theaters, crowded restaurants, and so on. There is definitely a pattern that must not be overlooked in the overall discussion on how to defeat these threats. LESSON #2 – It is becoming more evident that locations where large number of citizens gather on a regular basis, need to provide a much stronger and more comprehensive security plan. These plans must include education and training for the people who are frequently at this locations. The U.S. Department of Homeland Security has published recommendations for an active armed threat. In short, the message is – RUN, HIDE, FIGHT! Everyone needs a plan to survive one of these attacks. The simple Homeland Security plan gives those unaccustomed to violence easy steps to survive. First, run away from the threat. Don’t just stand there like a deer in the headlights. If running away is not an option, find a good place to hide. Most mass murderers are looking for quick kills, and are not taking the time to conduct thorough searches for victims. Part of hiding can be barricading the room you are in. Again, murderers don’t want to spend too much time fighting with physical barriers – they want a large number of victims. Finally, if the murderer has located your position, fight for your life! This is the ultimate battle of good versus evil. This U.S. Homeland Security video still shot shows the final step – FIGHT. Had the students and staff at Umpqua Community College been prepared with a plan of action, the events likely would have had fewer victims. People must prepare for the reality that if they are caught in this kind of horrible event they may have to take actions that could cause their death, or injury, but at the same time provide them the best chance of survival. Like so many mass murderers in our recent history, the Umpqua murderer (BlueSheepDog will not honor his name here) had several social dysfunctions. His parents divorced when he was 16. He struggled in school. He attended a school for learning or emotional disabilities. He enlisted in the U.S. Army but was discharged for failing to meet minimum standards during basic training (some reports say a suicide attempt). He had not seen his father for 2 years. He wrote of his sexual frustrations as a virgin. He gave another student a flash drive with his fascination on recent mass murders. He was 26 years old and still living at home with his mother. The Umpqua Community College murderer was for all practical purposes a boy with mental and social problems, that mounted to growing anger and frustration that led him to believe his actions would be the final release. His father, who has had little interaction with the murderer since the divorce, was quick to shuck any responsibility for the boy’s upbringing, by simply blaming guns as the problem. The murderer’s own writings clearly show that firearms were simply the means to carry out his terror, and his mental well-being absolutely played a role in his actions. There is much to be learned, but the murderer’s dysfunctional family life is clearly a big part of the puzzle. Mental health issues must stay at the forefront of the active shooter conversation, not lawfully owned firearms or firearm owners. LESSON #3 – There is a definite need to reevaluate the mental health system in the United States. 50 years ago America realized that too many people were being institutionalized for minor mental health ailments. That system did more harm than good. Non-violent people diagnosed with anxiety, hyperactivity, and other minor mental health concerns were grouped right along with the most serious mentally ill suffering from paranoia, schizophrenia, and manic-depressive disorders. That injustice brought about sweeping changes. However, the changes only tilted the pendulum disproportionately to the other side, allowing the seriously mentally ill to wander in society, instead of bringing a sensible balance. People who suffer severe mental illness need to receive systematic treatment both inside and outside of mental health facilities. There is a movement to bring mental health issues into the mainstream arena of health services, and that movement needs to grow exponentially. There is no doubt that a system with greater ability to positively influence the seriously mentally ill will have a tremendously beneficial effect on society as a whole. Unfortunately, these concerns have not reached the list of priorities for popularity-seeking legislators. Changes in the mental health system will not eliminate horrific events and deaths, but it could definitely make a significant impact for the good. Know the Facts, Do the Math! The media and anti-gun groups want everyone to believe that mass murders are prevalent and sweeping new gun controls are the only way to prevent them. However, even the simplest examination of the facts thoroughly debunks these claims. In fact, it has been shown time and time again that even if the proposed new legislation were in effect, the mass murders would not have been avoided. The only change would be that innocent, law-abiding citizens would be stripped of their rights to defend themselves from these horrific events. BlueSheepDog is appalled, just like every sensible law-abiding citizen, when a deranged murderer seeks some form of recognition by killing innocent unarmed people. Even one mass murder is too many, and we recognize that America has more than a fair share of these incidents. However, we cannot allow the hyperbole from the sensationalists to dominate the conversation. Here are some statistics from the Federal Bureau of Investigation that should place these active shooter events in a proper perspective. The overall number of mass shootings and victims is increasing slightly, but that number overall is still very low. 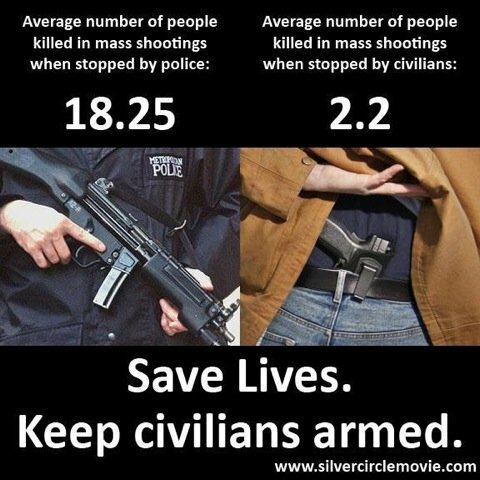 On average, less than 150 homicides each year are the result of a mass murderer (active shooter) event. That is only 1.3% of all firearms related homicides, and yet they get the most disproportionate amount of media coverage! 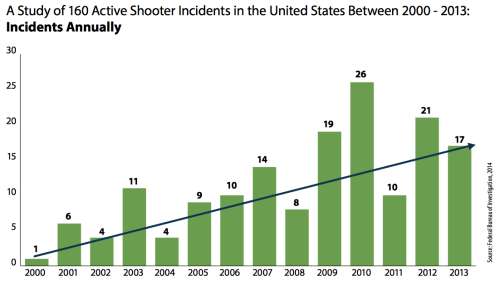 This FBI graph shows that there have been an average of 11.4 active shooter events each year from 2000-2013 (160/14 = 11.4). However, it should be noted that only 64 met the Federal 2012 statute designating “mass killings” as those which involve (3) or more killings in one incident. From those events America averages 34.7 fatalities per year and 39.7 injured per year. Another way to look at these tragic events is to recognize that on average each active shooter event results in 3.04 fatalities (160 events/14 years = 11.4 events per year; 34.7 fatalities/11.4 events per year = 3.04 fatalities per event per year). Additionally, on average each active shooter event results in 3.48 injuries (39.7 injured/11.4 event per year = 3.48 injured per event per year). 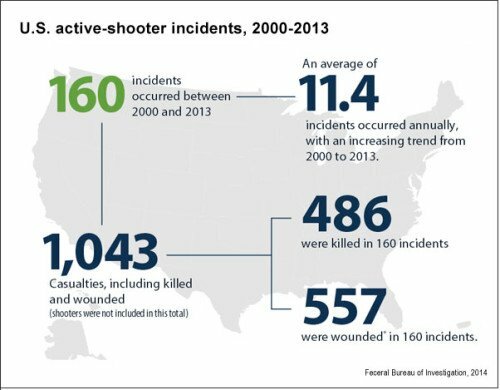 What these numbers tell us is that the vast majority of active shooter events involve a low number of casualties, but there are a few events that have tragically high numbers of casualties raising the overall averages of both fatalities and injuries. 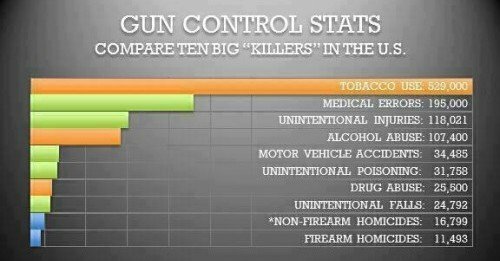 These numbers may not be completely accurate, but the vast differences of the causes of deaths in America is shown correctly. Americans have much more of a chance of dying under a medical doctor’s care than from firearms. Alcohol related fatalities continue to be a big killer in America, much more than firearms. And let’s not forget how deadly our highways are. 2013 – 32,719 motor vehicle fatalities; 10,076 of those were alcohol-related. 90 fatalities per day; with 250 injured every hour. 1960’s and 1970’s America suffered 50,000 overall traffic fatalities each year. 1990’s and 2000’s America suffered 40,000 overall traffic fatalities each year. 2013 – 84,258 firearm related injuries. 2013 – 33,169 firearm related deaths. 2013 – 67% of all homicides (11,208 fatalities) were with firearms. 2013 – 21,175 suicides were with firearms. 2013 – Firearms accounted for only 1.3% of all deaths! Overall violent crime is decreasing, including homicides. 7162 homicides happened in cities greater than 100,000 (64%). 5356 homicides happened in cities greater than 250,000 (48%). 76% of all homicides were one victim and one offender. Newark, New Jersey – 112 homicides. St. Louis – 120 homicides. New Orleans – 156 homicides. Los Angeles – 250 homicides. New York – 333 homicides. Chicago – 415 homicides (500 in 2012). Though active shooter and mass murder incidents continue to be a serious concern of all Americans, they are still statistically rare. The media have done a disservice to the entire country by promoting the perception that these events are prevalent and involve huge numbers of casualties. In reality, the vast majority of homicides involve crimes of passion with one murderer and one victim, or crimes involving criminals on criminals (with gang violence prevalent). 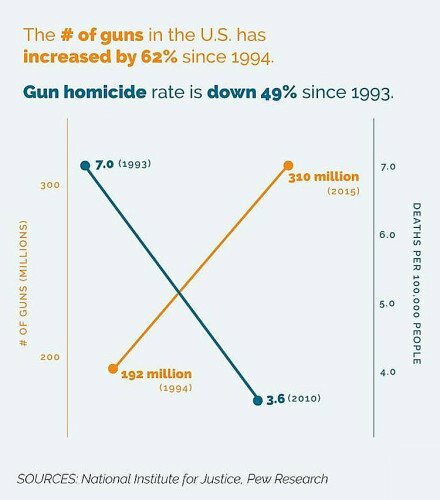 Let’s not forget that these homicide by firearm numbers also include justifiable homicides where the good guy killed the bad guy. When a passenger aircraft crashes with fatalities the media goes bonkers. There are incredible calls for investigations, and cries of “how could this happen”. The reality is that sometimes bad things happen to good people, and for a variety of reasons. Yet, statistics clearly show that airline travel is still one of the safest methods of transportation. The number of fatalities from active shooters, compared to all homicides, also show that statically Americans are very unlikely to be killed in one of the horrific events. The (8) cities listed above accounted for 1935 homicides in 2013, or 17% (almost 1 in 5) of all homicides (CDC numbers). Our biggest cities are havens for the conditions that lead to murder, and often the biggest cities exhibit the greatest disparity of economic conditions and failed governmental programs that are touted to be the solution. Firearms ownership is dramatically up, while homicides drop by half.